How To Use Tea Tree Oil for Acne | How Can It Help Fight Acne? If you’re one of the fifty million Americans impacted by acne, you know how wretched it is. Whether it’s a giant pimple that inconveniently pops up before a big event or painful, cystic acne that leaves scars across your face, acne leaves you feeling insecure, anxious, and even hopeless. What’s worse is that over the counter acne medications can strip your skin of its natural moisture, causing it to produce even more oil, leading to even more acne. Plus, these products are often filled with harsh chemicals that aren’t good for your skin or body. Fortunately, there are natural options that are just as effective--if not more effective--than their harsh counterparts. 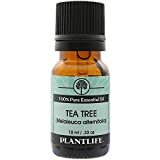 One of our favorites is tea tree oil, an oil made from the Melaleuca tree, a shrubby green tree that thrives in Australia. What is Tea Tree Oil and How Can It Help Fight Acne? What Does the Research Say About Tea Tree Oil? Is Acne the Only Skin Concern Tea Tree Oils Helps With? How Often Should You Apply Your DIY Tea Tree Oil Treatment? Most standard acne medications treat acne by removing excess oil from the face to slow down the potential clogging of pores. However, this can further damage the skin, leading to both increase oil production and increased acne. The most common active ingredients in over the counter acne medications are benzoyl peroxide and salicylic acid. If you see a dermatologist, you’ll likely be written a prescription for an antibiotic to kill the acne-causing bacteria on your face. If these aren’t working for you or you want to look for a natural alternative that won’t hurt your face while it tries to help it, the next step is to learn how to use tea tree oil for acne. Tea tree oil has been in use for centuries. It has a grassy, slightly sharp aroma similar to eucalyptus leaves. It’s made via steam distillation and is usually diluted in 5%-10% quantities. Like menthol, it leaves a cooling sensation on the skin, so it’s often used to help with breathing difficulties. It will sting severely if it enters the eye or sensitive nose membranes, however, so be careful! Tea tree oil can be used to treat fungal infections like athlete’s foot, dandruff, and a whole variety of other common problems, but its powerful abilities to both fight bacteria as well as its ability to soothe and heal the skin make it a powerful agent against acne. A 2007 study in India divided sixty patients with acne into two groups. Once received a placebo topical treatment and one received tea tree oil gel. Each group applied the treatment daily; study authors found that acne lesions were improved more than 3.5 times and acne severity improved nearly six times over. Another study, this one published nearly three decades ago, compared the use of 5% benzoyl peroxide, still one of the most common acne treatments, with 5% tea tree oil on 124 patients with acne. The study authors concluded that tea tree oil was just as effective as benzoyl peroxide. And, while it worked slightly slower than the standard treatment, patients who used it experienced fewer side effects. One of the most promising studies on tea tree oil and acne comes from research journal Clinical Pharmacology. This study was published at the very end of 2018; it aimed to research the use of plants in treating acne. Scientists divided sixty patients with acne into three groups: a placebo (control) group, a group that received erythromycin cream, a common antibiotic used to treat acne, and a group that received a cream with propolis, a compound that comes from honey, tea tree oil, and aloe vera. At the end of the study, the results were clear: the tea tree oil combination was better at reducing acne severity, occurrence, and scars than the antibiotic! As we noted earlier, acne isn’t just the result of bacteria proliferating on your face or over-zealous oil production. Acne can also be caused by things like dermatitis, an allergic reaction to a foreign substance. Acne can also look suspiciously like eczema or psoriasis, or simply inflamed skin. Incredibly, tea tree oil doesn’t just help with acne by killing bacteria; it also helps by healing and soothing irritated or damaged skin. The bottom line is that tea tree oil is effective when it comes to treating a wide variety of skin concerns. Ready to learn how to use tea tree oil for acne? Tea tree oil is inexpensive and easy to find. You should never ingest it; it is only for topical use. You should also first do a patch test since tea tree oil can cause an allergic reaction in some people. And again, be careful when you apply it around sensitive areas, like the eyes, as it can sting or even burn! Get better results with sun essential oils. Sun provides the best essential oils. Love the smell and feel great. Sun makes the best quality premium oils. 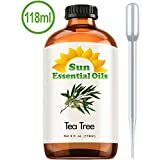 You can find face washes and lotions with tea tree oil in them already, but to make sure you’re getting the proper tea tree oil dilution and to make sure you’re not getting extra, harmful ingredients, you can make your own tea tree oil treatment. It’s easy. First, you’ll need a clean jar or bottle. Dilute tea tree oil with an oil that has a very low comedogenic rating. This means that it won’t clog your pores. Coconut oil, for example, has a high comedogenic rating and is unsuitable for your face as it could worsen your acne. Popular oils for acne-prone skin include castor oil, grape seed oil, jojoba oil, sweet almond oil, and olive oil. Mix tea tree oil with your favorite carrier oil in a 1:12 ratio; for every drop or two of tea tree oil, use twelve drops of your carrier oil. Combine, and then use twice a day as a full-face treatment or simply as a spot treatment. You can leave it on all night long but if you feel it’s too oily in the morning, let it sit for thirty minutes and then gently wipe away with a damp cloth. If you want to improve tea tree oil’s efficacy, you can combine it with other powerful, natural, acne-fighting solutions like honey and aloe vera gel. You can get aloe vera gel straight from the plant; it’s packed with a dizzying array of vitamins and minerals that will add moisture to your skin without making it oily and help repair any damage or inflammation. Honey, as the study above mentioned, also has powerful acne-busting properties, in part thanks to the vitamins it packs and also thanks to the fact that it has antimicrobial properties. It’s likely too sticky to leave on your face during the day, but you can combine honey, aloe vera, and tea tree oil into a mask to leave on all night. Wake up the next morning to glowing skin and watch your acne fade away! Thanks to decades of scientific research, using tea tree oil for your acne is a no-brainer. It’s inexpensive and easy to combine into a treatment for your face to end acne naturally. Here’s to clearer, healthier skin! Previous articleWhat Is the Power of Positive Thinking?